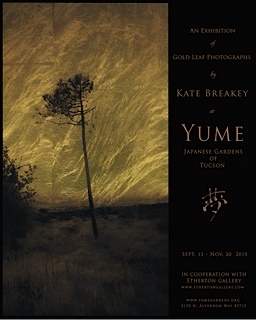 “A long-neglected process that utilizes gold to render highlights with startlingly more depth and luminosity than ordinary photographs appears in a modern incarnation in the exhibit Gold Leaf Photographs by Kate Breakey, opening September 11 at Yume Japanese Gardens of Tucson, 2130 N. Alvernon Way. A Tucson resident born in Australia, Breakey enjoys international acclaim for her images that achieve luminous effects through the exploration of antique photographic processes that have become part of art history. The images in her current show are modern versions of Orotones. In their heyday — the early 20th century — Orotones were created by printing a positive photographic image on a glass plate and then coating the plate with lacquer impregnated with bronze, silver, or gold metallic pigment. In her resurrection of this process, Breakey uses contemporary media and technology to print her photographs digitally on glass and then flawlessly hand applies 23.5-karat gold leaf to the back of the plate. Light penetrates the glass plate, strikes the gold leaf underneath, and beams back, illuminating the image from behind and creating a picture that glows and shimmers from within.The effect is reminiscent of the luminosity of a gilded Japanese screen. The traditional Orotones most familiar to Americans are those of Edward S. Curtis, the ethnologist and photographer of the American West who documented Native American peoples in a massive collection of images made from 1906 to 1930. Since 1980 Breakey has exhibited in nearly 150 solo and group shows in the U.S., France, Japan, Australia, China, and New Zealand. Her images are held in many public institutions, including the Center for Creative Photography at the University of Arizona, the Museum of Fine Arts in Houston, the Australian National Gallery in Canberra and the Osaka Museum in Osaka, Japan. She is represented by Etherton Gallery in Tucson, one of the Southwest’s premier galleries and the co-sponsor of the current exhibition. For more information visit http://www.yumegardens.org, emailyume.gardens@gmail.com or call Allen Boraiko of Yume Japanese Gardens at 520-343-0926. ​Entry is free with regular admission to the Gardens. Carolyn’s note: Yume Japanese gardens itself is closed for the summer till October 1st, but this exhibit will be open daily, till Nov. 20, 2015.